Klebsiella pneumoniae colony morphology and microscopic appearance, basic characteristic and tests for identification of Klebsiella pneumoniae bacteria. 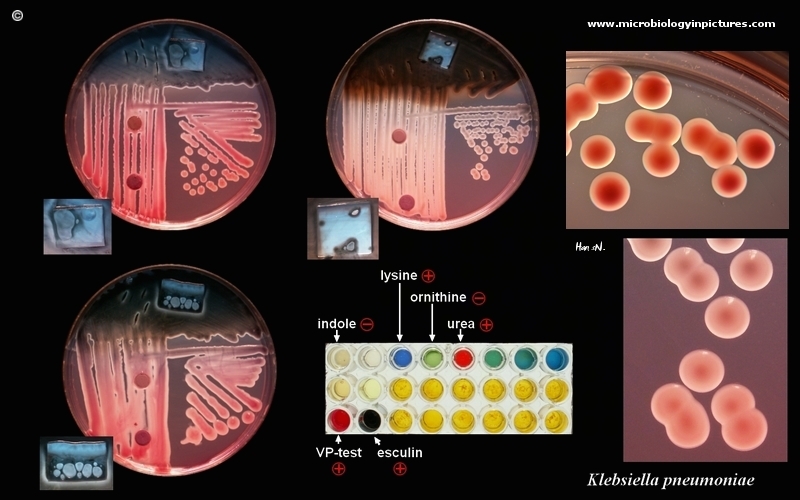 Images of K.pneumoniae. Klebsiella peumoniae treatment and antibiotics used for K.pneumoniae infections. in detail left down side of each plate) and is lactose positive (but on Endo agar its colonies often remain quite pale). Unlike some similarly looking strains of Enterobacter cloacae is K. pneumoniae lysine "+", ornithine "-", arginine "-"
(E. cloacae lysine "-", ornithine "+", arginine "+"). Klebsiella pneumoniae is a Gram-negative, non-motile, encapsulated, lactose fermenting, facultative anaerobic, rod shaped bacterium found in the normal flora of the intestines. It is clinically the most important member of the Klebsiella genus of Enterobacteriaceae. It naturally occurs in the soil and about 30% of strains can fix nitrogen in anaerobic condition. As a general rule, Klebsiella infections tend to occur in people with a weakened immune system. Many of these infections are obtained when a person is in the hospital for some other reason (a nosocomial infection). The most common infection caused by Klebsiella bacteria outside the hospital is pneumonia. New antibiotic resistant strains of K. pneumoniae are appearing, and it is increasingly found as a nosocomial infection. Klebsiella ranks second to E. coli for urinary tract infections in older persons. It is also an opportunistic pathogen for patients with chronic pulmonary disease, enteric pathogenicity, nasal mucosa atrophy, and rhinoscleroma. Feces are the most significant source of patient infection, followed by contact with contaminated instruments. POS. NEG. NEG. POS. POS. NEG. POS. POS. NEG. NEG. NEG. POS./POS. POS. POS. POS. POS. POS. POS. D POS. In ESBLs avoid cephalosporins. Carbapenemase producers (KPCs) are resistant to carbapenems, penicillins, cephalosporins, fluoroquinolones and aminoglycosides.